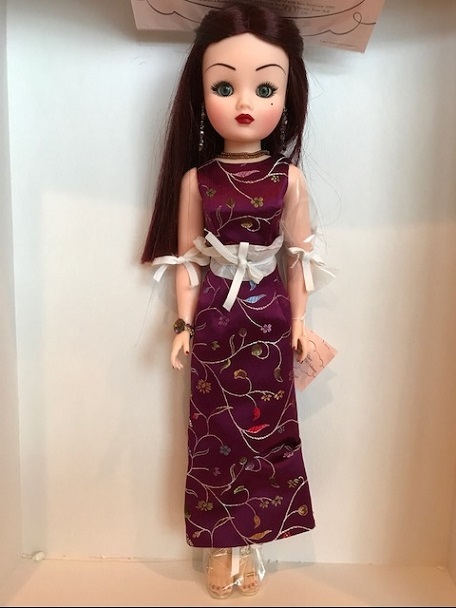 "Chinoiserie Cissy" has blue eyes, a classic beauty mark and a dramatic blending of brunette hair with fuchsia highlights. 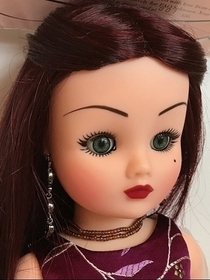 The sides are pulled back and held in place with a black hair ornament trimmed with 'ruby' stones. 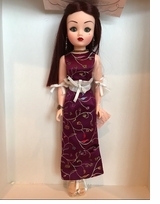 She's wearing a full length dark fuchsia sheath (lined) embellished with elegant chinoiserie style embroidery. She's accessorized with a necklace of multiple stands of tiny beads; an ornate bracelet and earrings; sheer pantyhose and metallic, stappy, heeled sandals. Never displayed. Her Certificate of Authenticity shows her to be 1 of 150!